Choose benches instead of chairs for your dining table. More people can sit on a bench, which is also a great seating option for kids. Benches will also help make the room look more open and inviting. Purchase a tall dining table and bar stools. Place the table and chairs in the corner of your kitchen to allow for more open space. It can be a breakfast nook for the family on regular days and can also serve as a cocktail bar for special occasions. 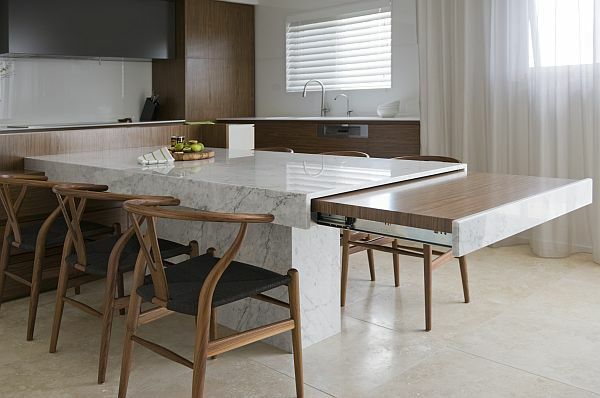 Use your dining table as a kitchen island. If your kitchen and dining areas are compact, you can utilize your dining table as a kitchen island too to give you more room when prepping your meals. Place your dining area near your outdoor space. If your home has an access to an outdoor space, consider putting your dining area in that spot. It will be an intimate dining place for you and your family to enjoy meals outside.